Turners Tunnels on the the N71 are a series of beautiful hand hewn rock tunnels. 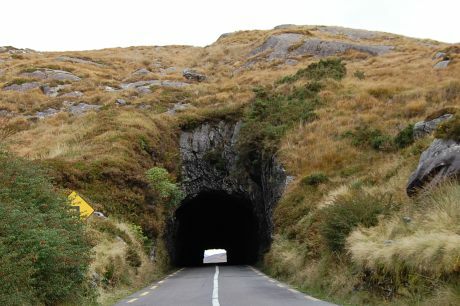 The main tunnel is pictured above and is on the Cork-Kerry border. On the Kerry side the main tunnel is followed by three more mini-tunnels, a set of twin tunnels and a final short tunnel. As you approach Glengarriff from the Kenmare side the main tunnel dramatically frames the entry into the county of Cork. The vista that unfolds before you on the Glengarriff side is stunning with a view of Barley Lake and Bantry Bay.